:: Question of the Day - What is Champagne? Congratulations to Michelle Dender for being our Lucky #8 last month and winning the Jade Roller Ball! Thank you to everyone that participated, and be sure to keep an eye out for our monthly contests. Guys - don't forget Valentine's Day is Saturday, February 14. Give your special girl an hour of relaxation with a facial treatment by Nicole. Remember you can always buy your gift certificates online at www.RaspberryMoonST.com if you don't have time to stop by. Since we are in the month of love I thought maybe we could use a little reminder to show the ones we care for how much we love them. Love can come to us in some many different ways: our friends, the way the sun is shining, the laughter of a child, the thoughtfulness of others. So be on the lookout for those little things too! I know we all get busy and forget all the things we have to be grateful for. I know I am guilty! I challenge you in this month of love to find that love that we sometimes are to busy to see or feel. Be honest with the person you hold dear, treat them kind and special, remember all those things that you loved about them when you first started dating, take a night and have a real date. I met a lady just for the briefest of minutes who lost her husband suddenly. She said to me “Girl, if you are married or have a special someone love them all you can because you never know when they will not be there with you and you will miss the dirty socks they left on the floor!” For those of us who are single be open and true to yourself, ask for what you want, and be yourself. Love is good for your health so be sure to give and get a little love everyday! Wishing you all the love you desire. Question of the day - What is Champagne? Did you know that for a wine to be called Champagne, it must come from that particular region of France that is located 90 miles east of Paris in the rolling hills near the towns of Epernay, Reims, and Sézanne? Anyone in the world can make a sparkling wine in the méthode champenoise, but only the Champenoise can make Champagne. Champagne is a toast to optimism, an attempt to bolster defiance, or a companion for consolation. According to Napoleon, "In victory you deserve it, in defeat you need it." 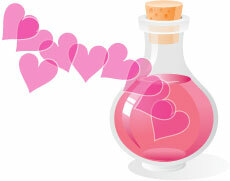 For those of you who want to give love a push in the right direction, here is a Love Potion for you. Be careful what you wish for, you might get more than you bargained. Remember with Essential Oils, less is more. All these blends can be used in diffusers, used to scent body powders, to create a scented spray, in a massage oil or as a personal scent (dilute to 1% in jojoba) and worn on pulse points. Actual formulas are not given as part of the power of a potion lies with the creator of the blend. The oils are listed in terms of what portion of the blend they form: MA=major, mi=minor, T=trace. May you find love in your life and peace in your heart. 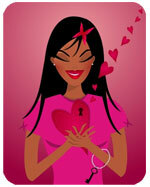 From Paula Polman, Edmonton AB Canada, http://www.allfreecrafts.com/valentine/love-potions.shtml. Come join in the fun and experience the delectable feel of our Lip Candy Glazes. February 19th from 5-7 - drop in and plant a kiss on our kissin' tree. If you can't come to our Kissable Lips night feel free to make an appointment to feel the delectable lip candy glazes. At the end of the month, the winner with the best set of lips will win a Lip Candy Glaze ($25 Value) of her choice. Our luxurious Champagne Facial combines the hydrating, exfoliating, and anti-oxidant properties of both Champagne oil and grapes. The Champagne Facial Mask removes dead skin cells, deeply hydrates, and helps to fade age spots due to over exposure to the sun. Your skin will feel smooth, refreshed, and hydrated. This mask provides a large variety of anti-oxidant properties. It is especially suited for dry, sun damaged, and aging skin types. Mention this newsletter when you book a Champagne & Rose Facial Treatment and get a free Lip Treatment! The perfect kit to create those perfect lips. Our lip restore kits have 3 wonderful products to treat your lips fabulously. Lip Exfoliator - Take It All Off! Lip Serum - Liquid Rainbow! Luminescent liquid crystal lip treatment provides iridescent lip accent colore. Maxi lip to plump lips with 30 days use, three times per day. Liquid crystals moisturize and gloss the lips. Aloe, aromatherapy and vitamin E assist the repair of chapped, dry lips. Bed of Roses Lip Polish - Won't kiss off! 50% mineral pigment & no dyes with tea tree to heal. Shake well before applying to mix the 50% mineral formula. Bed of Roses is a universal colore. Our lip polishes are THE ultimate in long-lasting coverage without staining the lips, about 6-12 hours. Solid and particulate colore that cannot be absorbed by the body. Purchase our Lip Restore Kits for $52.50 and receive a complimentary Lip Candy Glaze ($25 value). Did you know that your choice of lip colore can actually help accentuate your eye colore? Blue eyes are enhanced by lip colore with a peachy, apricot or warm brown tone. Green eyes look greener when a rosy, or red, colore is applied to the lips. Brown eyes look more golden when wearing a plum, or lavender, colore on the lips. The Colorescience Lip Polishes, Lip Serums, Lip Accents and Lip Candy Glazes all contain palmitoyl oligopeptide. This tripeptide has been shown to plump the lip tissues by stimulating hyaluronic acid production. It is clinically proven to regenerate the skin's upper layers by strengthening and thickening the epidermis. Colorescience lip products are nontraditional in this approach to hydration, since traditional lip products are advertised to hydrate due to their slick texture. Colorescience lip products feel like you are wearing nothing at all, and all the time they provide an ingredient to make your lips look plump and full! Email me a quote on why you enjoy coming to Raspberry Moon, the look of our new room or why you enjoy one of our products or services. We will place every response that we receive by the end of the day on February 6th into a hat, then we will draw our winner! Looks like I should be here all of February!